ON FEBRUARY 2, 2002, the Atomic Energy Regulatory Board (AERB) may have finally brought the curtain down on India's first pressurised heavy water nuclear reactor - Rajasthan Atomic Power Station's unit-I (RAPS-I). India's nodal regulatory body for its civil nuclear establishment took the decision to decommission RAPS-I by April 30, 2002, dubbing it as a "matter of caution". Ironically, AERB's move comes just a few weeks after Union power minister Suresh Prabhu claimed that the country would generate 2000 megawatts of extra electricity from nuclear energy every year. But considering the poor track record of RAPS-I, located at Rawatbhata in Rajasthan, the closure directive is hardly unexpected. AERB noted in its 73rd board meeting: "Taking a holistic view of the problems encountered and as a measure of abundant caution, the board has decided that in its present condition, the operation of RAPS-I will be allowed only up to April 30, 2002." The Nuclear Power Corporation of India Limited (NPCIL) - which manages RAPS - has, however, put a different interpretation on the measure. It says that after being upgraded the unit will be revived soon. But sources point out that refurbishing the facility is likely to cost about Rs 200 crore and the returns may not be commensurate with the investment. 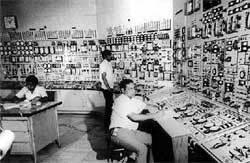 The reactor went critical in 1972 with technical assistance from Canada. The functioning of the unit was disrupted in 1974, when Canada slapped sanctions on India after its first nuclear implosion. Ever since, technical hitches and accidents have marred this project despite numerous attempts to revive it. Though prime minister Atal Bihari Vajpayee has vouched for the safety record of RAPS, activists aver that it is a high-risk plant. They allege that due to inadequate precautionary measures the radiation level in and around the units is posing a major health hazard. The AERB directive may have been long overdue, but for India's nuclear set-up it has come as a bombshell. Experts believe that RAPS-I was being allowed to continue running only because it is one of the major sources of the country's weapons-grade plutonium. To date, at least 25 kilogrammes of reactor-grade plutonium has been extracted from the unit's spent fuel. And there is potential for much more to be reprocessed. No wonder the resistance to the closure from official quarters.